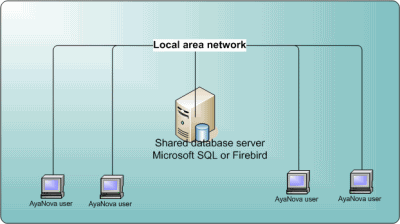 •AyaNova can be configured for network use using either the network Firebird Server, SQL Express and SQL Server. AyaNova is not compatible with MySQL. 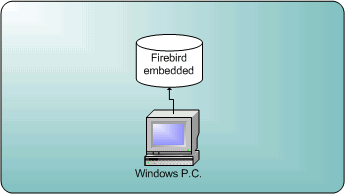 •The image below shows an example of a AyaNova network installation - local networked computers run the AyaNova program connecting to the networked AyaNova database on the server. •The specific steps you follow in the link above go through installing the AyaNova program at the database server, configuring the database server, set up of the AyaNova database for network use with that database server, editing of the AyaNova configuration file on the server so that it accesses the networked AyaNova database, and installation and configuration of AyaNova at the users computers.